I always get asked, “What is the best way to scale my business?” Even by my business coaching clients. Based on my experience, scaling a business through values will help to achieve sustainable growth, in any industry. Value-based companies should start with understanding their core values and how to scale those values before worrying about how the company itself will grow. Failure to scale these values causes all sorts of problems when the company begins to scale. Your core message gets lost. Your team’s motivation decreases. Your lack of a strong corporate culture leads to a lack of production. Losing sight of the values that comprise your company culture makes organizations less successful, efficient and effective. It can even cause companies to fall apart. Don’t undermine or undervalue your company’s values or mission. Studies have shown the impact that a focus on company values has on operations. According to Deloitte research, mission-driven companies have 30 percent higher levels of innovation and 40 percent higher levels of retention. Companies with happy employees that are aligned with their core values also outperform the competition by 20 percent, Gallup found. When new interns start at our firm, we tell them that we do not teach about working in sports. We only teach four things, the four core values of our company: gratitude, empathy, accountability and effective communication. In order to get everyone aligned, we reinforce these values in all three stages of scaling our business, and we use different strategies to instill them. Invest in the learning stage. Understand that your new employee is an investment in your company, not a privilege. You are investing in a person’s professional growth and, for those with a values-based business, you also invest in their personal growth. The learning stage is where you tell stories and share content which will get your team aligned with your core values. Find people who represent the values you aspire to follow and tell their stories. Provide examples of people who succeed with those values. Also, share times of failure that happen when people do not live aligned with the standards that your team is supposed to follow. The next stage is the execution phase, where our team members mature through those core values and eventually become profitable. The execution stage is where an employee learns to balance the values of a company while also maintaining profitability for the firm. Having an appropriate compensation package is key at this stage. What matters is that there’s a learning phase that we as employers invest, an execution phase that leads to profitability, and then an equity phase where we share our company assets via 401(k) options, warrants or even investment from our employees. Equity stage: Retain and reward. The equity or partnership stage allows your company to scale and thrive while maintaining a connection to core values. Equity or partnership rewards employees who have shown a commitment to your company and its culture over an extended period of time. Setting an appropriate timeline to transition from employee to partner is important. People need to know that there is a light at the end of the tunnel. SAS shows how to scale. Some of the biggest companies have been able to grow and scale because of their commitment to their culture. Billionaire Jim Goodnight’s company, SAS, is one of the many companies that operate based on values or a mission. They are committed to a holistic approach, providing core values, support and appreciation to their employees. They see themselves as “authentic, accountable, curious and passionate” and put those values into everything that they do. If you remain firmly rooted in your core values and principles, you’ll be able to not only bring monetary success to your company, but personal success to yourself, your employees, your community and the people you interact with every day. Remember, nobody can succeed without inspiration. Show them how to give back, how to be of service and how to succeed. Empower them with values that will change their personal and professional life. Inspire other companies to follow your lead by sticking to your core values and working to empower others to be successful. Polarizing Brands Not Exactly Hurting, But Should Your Small Business Get Into the Act? Morning Consult and its survey of 336,370 Americans has revealed the most polarizing brands in the country aren’t exactly hurting for business. The top 10 brands are directly or indirectly related to the President, with Trump Hotels taking the number one spot. This is the inaugural survey of Morning Consult’s Most Polarizing Brands designed to rank brands, companies and organization deemed the most divisive between Republicans and Democrats. The top 30 brands were selected from a pool of 1,900 organizations in a survey carried out online from October 3, 2017, to January 2, 2018, from a national sample of U.S. adults. While becoming a polarizing brand can have negative consequences, it doesn’t seem to be affecting these large businesses. The same probably can’t be said for small businesses, especially if they are located in an area where the demographic is not supporting their political views. Here are some of the highlights from the survey. 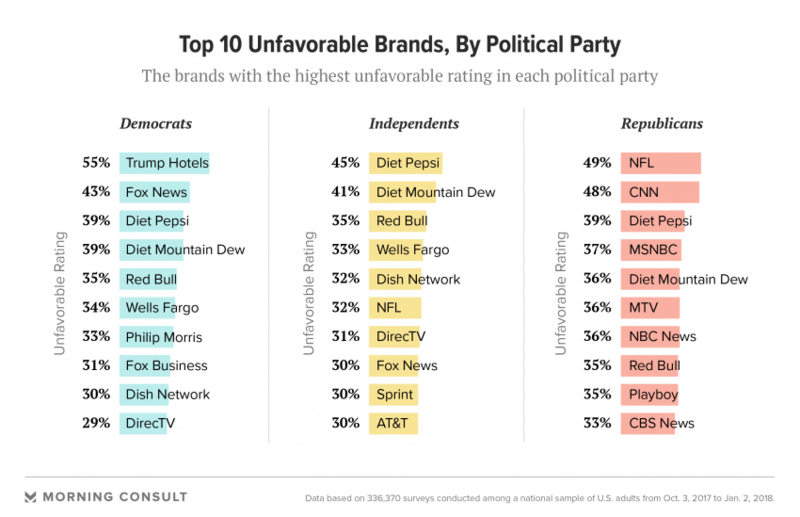 The most unfavorable brands for Democrats included Trump Hotels at 55 percent, Fox News at 43 percent, and Diet Pepsi at 39 percent. Republicans also listed media outlets not particularly enjoyed by the President in the top 10, but the NFL came in first at 49 percent followed by CNN with 48 percent. Interestingly Republicans and Democrats share a dislike of one particular brand. Diet Pepsi also came in third with Republicans at 39 percent. Independents had a different take on what was really unfavorable because Diet Pepsi was tops at 45 percent, Diet Mountain Dew was second at 41 percent and Red Bull was third at 35 percent. The split among respondents was 32 percent Democrat, 34 percent Republican, and 34 percent independent. For Republicans, media companies dominated the top 30 taking all the spots from number two all the way to number 15, as well as others down the line. The division was down Democratic and Republican lines, with Trump supporters choosing the same likes and dislikes as the President. And for Democrats, brands associated with Trump were disliked. In sports, the NBA and the NFL were preferred by Democrats, while NASCAR and the NHL were favored by Republicans. But when it comes time to order pizza to watch the big game, Papa John’s, Little Caesars, and Pizza Hut, were favored by Republicans over Democrats by a wide margin. What about big box stores? Walmart was the choice for Republicans while Democrats preferred Target. Small business owners are often cautioned against becoming political in marketing or other communications. Although there are obvious exceptions. If you are marketing political T-shirts favoring a particular point of view or an online media channel with a distinct political slant, becoming political in your marketing might make perfect sense. It should also be remembered that not all the brands in question took a public political stand and most have strong enough business models to survive shifting sentiments. So small business owners must decide before being branded political whether the designation will help or hurt in the long run. Mornings aren’t for everyone: Some people say they’re at their most creative or effective in the early morning hours, while others perform better at night. However, it’s no secret that executives tend to get up before dawn to start their day, and have a routine that helps them get through the day more efficiently. But, can someone’s morning routine have a direct correlation to how the rest of ther day goes? Personally, I’d say yes. I’m an early riser, myself. To be productive, I need only five to six hours of sleep each night. Once I get up, I check my email and start communicating with my team what needs to get done that day (my team teases me because of the many messages awaiting them when they get up themselves). I’m usually in the office around 7:30 or 8 a.m. I may need up to four espressos (lots of milk) or,sometimes, Red Bull, to get started (not the best thing, but it gets me ready for the day). I’ll print out the day’s schedule, with meetings, conference calls, interviews, etc. and determine any actions needed, then write down five big things I must do that day. I’ll also write five things I want from my team, whether they need reminding and any new assignments they’ve got. Overall, I like to start the day with an empty mailbox, though that doesn’t always happen. At that point, I’ll start my calls and meetings, and maybe put out a few fires along the way. “I wake up about 6:30 a.m. and the first thing I do is walk my beagles. During this time, I usually think about what I want to accomplish during the day. I mentally play out any potentially important conversations, or transactions, that I know I need to have during the day. I try to anticipate what the other people are going to say or do and what questions they are going to ask; and then I come up with answers to those questions. “One thing that stays the same on my calendar every day, no matter how hectic the schedule gets, is my morning workout. My Friday morning workout, the longest of the week, includes a note that says ‘Never cancel.’ I feel strongly about pre-framing my day with a good sweat. “My morning doesn’t really start until I’ve had my coffee. From there, I have two lists that set my day: my list of incomplete to-dos from the previous day and my list of to-dos for the day ahead. These lists really help me make the most significant impact at the quickest pace possible. “I guess I’m a dreamer, in more ways than one. That is, I often dream at night; and sometimes my dreams are quite literal and help me solve a problem. I dream of ways to approach business issues I’m dealing with, or ways a product might accomplish a particular function. I keep a pad of paper by my bed and usually wake up and write a note when I dream something that seems possibly helpful. “I am out of bed by 5 to 6 a.m. I have an unwritten rule with myself that once I wake up in the morning, no matter how early it is, I get out of bed and start the day. I will work from my home office and try to accomplish tasks that I need to get off my plate right away; this is typically from 5 to 9 a.m. This time allows me to focus 100 percent on the task at hand. My mornings are focused on being proactive and my afternoons tend to be much more reactive to tasks like meetings and emails. Getting up early is one routine that successful people have in common. They feel their most productive during the early morning hours, partly because there are fewer distractions. Other things “early worms” have in common are productivity, self-discipline, more energy, a greater sense of satisfaction, a distraction-free environment, more family time and the ability to stay ahead. If this list sounds good, there are ways there are ways you too can become an early riser, though it won’t happen overnight. Try getting up a couple of minutes earlier each day until you get to where you want to be. One thing that seemed to work when my kids were younger was having an alarm clock at a distance. Not too long ago, the marijuana business was considered illegal in most American states. Today, it’s a fast growing industry, legal in several states across US. Not surprisingly, the number of “potpreneurs” is growing every minute. But what unique opportunities and challenges does the cannabis industry present? New data from business career site BusinessStudent provides an in-depth analysis of the marijuana industry and its growth prospects. According this data, the legal cannabis market is expected to be worth $24 billion by 2025. Moreover, the cannabis market is set to create almost 300,000 jobs by 2020. Interestingly, the number of women executives in the cannabis industry is 27 percent. That’s 4 percent higher than the national average of 23 percent, reflecting the opportunities for women in this business. Two of the best states to start a cannabis business are Colorado and California. Thanks to its open licensing laws, Denver has twice as many cannabis dispensaries as it does Starbucks. As for California, the state is expected to have recreational cannabis business licenses available in 2018. This will pave the way for a variety of cafes, restaurants and dispensaries. Entrepreneurs in New York and Minnesota, however, might have to wait before they can start their marijuana business. New York has harsh regulations and highly competitive licensing, while Minnesota allows just eight dispensaries in the state. Despite being legal in several states, most online networks, social media sites, broadcasters and print publications enforce some kind of ban on cannabis ads. States with legalized cannabis restrict ads, such as preventing businesses from running commercials or buying billboard space where children may see it. There are several reasons why passport demand is at an all-time high, for both applications and renewals — it was predicted years ago that 2018 would see the demand peak. For starters, the Western Hemisphere Travel Initiative of 2007 stipulates that all individuals traveling to the United States from other countries must show a valid passport or other approved documentation to enter the country. This includes crossing the border by land or water from Canada, the Caribbean and Mexico. In the past, all that was required to re-enter the United States from those regions was a valid U.S. driver’s license. I remember spring break trips to Cancun and weekend trips to Canada in my younger days — no passport was required — just my driver’s license. As a result of this change, the U.S. Department of State issued more than 18 million passports in 2007. At the time that was a record number — but it’s about to be broken, more than a decade later, because those passports are now up for renewal. The State Department estimates that the surge of passport renewals that will be spilling over into 2018 and 2019 — combined with other new passport applications — will push the number of passports issued this year to more than 21 million, after more than 20 million applications in 2017. Also, the U.S. Department of Homeland Security is implementing phase four of the REAL ID Act this month, which sets new standards for state issued driver’s licenses and identification cards. The implication is that everyone who flies must have a REAL ID-compliant identification by October of 2020. Starting January 22, 2018, travelers without ID from a compliant state (or one that has been granted an extension) will need to provide alternate identification — a passport is acceptable. During the most recent 3-day government shutdown my Facebook feed had several requests seeking help renewing passports, proving two points — there is a high demand as renewals are up and most people wait until the last minute to handle it. I am no different. Last year, I waited until the last minute and had to use a service to get my passport expedited. I used a company that was founded and then later sold by entrepreneur Adam Boalt. Aside from being an entrepreneur I respect, Boalt is also my neighbor in a sense — his Miami office is literally across the street from my condo. His newest company, govWorks, launched earlier this year, and its mission is to change the way the public interfaces with both federal and foreign governments. The company created a platform aimed at simplifying the processes for travel visas, U.S. passports and other related travel documents by storing customer information securely. Boalt’s office sits in Brickell City Centre — a billion-dollar shopping and mixed-use development. Since it’s across the street from me and home to two of my favorite destinations — the Apple store and a Mexican food restaurant — I am there often. I last spoke to Boalt right as govWorks was launching and he was excited about the timing, saying, “We’ve entered the market at a very critical time. With that in mind, we think we can solve many of the challenges facing the industry moving forward with our brands.” Timing comes into play a great deal — the wrong timing can lead to missed opportunities and failed ventures. Here are five key takeaways from our conversation, that can help you avoid travel headaches related to passport applications and renewals. 1. Don’t wait until the last minute to renew your passport. This is much easier said to done, and I am living proof. Last year, I knew well in advance that I needed to renew before my trip, but I waited until the last minute and had to get it expedited. Even if you still have a few months before you need to renew you might find yourself in a bad situation, which I wasn’t aware of. “U.S. passports are valid for ten years. However, many countries will not accept a passport with less than six months of remaining validity. If possible, you should get a passport renewal at least nine months before it expires,” explained Boalt. If you wait until the last minute like I did, you will need to have it expedited. 2. Get a passport with extra pages if you’re a frequent international traveler. “If you spend a lot of time traveling internationally it might be helpful to apply for a 52-page passport book instead of the standard 28-page passport,” suggested Boalt. Personally, I didn’t even know this was an option, and I wish I did. When you consider that each page can accommodate about four stamps, that equals two countries per page — entering and exiting — you see that the larger option will satisfy the needs of those that are constantly traveling internationally. 3. Make sure your children have passports. The REAL ID enforcement now gives parents reason to get their children a passport even if there isn’t any international travel planned. For example, my sister’s family lives in a state that currently isn’t compliant and has an extension through October 10, 2018. Unless her state complies in time, air travel within the United States after that date will require her entire family, kids included, have U.S. passports. I also wasn’t aware that a child’s passport expires much sooner than an adult’s. “Children must have a valid child’s passport in order to travel internationally. U.S. child passports are also only valid for five years,” explained Boalt. 4. Understand the importance of a second passport. When Boalt mentioned this I immediately wondered why. I didn’t even think it was possible to poses two valid passports, but it’s true. In fact, President Donald Trump’s former campaign chairman Paul Manafort held three valid U.S. passports. “If you often travel internationally you might want to consider getting a second passport. Some countries reject passports that contain visa stamps from certain other countries. Second passports are also helpful for frequent travelers who might need to apply for multiple visa applications on an ongoing basis,” advised Boalt. 5. Find out if you need a travel visa before you travel. A lot of people show up to the airport only to be turned away from their flight because they forgot or simply weren’t aware that they needed a travel visa. Creating a simpler way to handle this process is what led Boalt’s company to create Travel Visa. “We created a platform that allows people to get the visa requirements for every location and then quickly obtain it online,” he explained. The requirements can be confusing — make sure you are well-prepared. An infographic by Cleaning Services Group, a provider of domestic and commercial cleaning services, shows the direct correlation between a clean and tidy office space and a more productive day’s work. 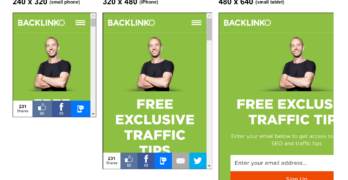 Let’s say you have some photos on your phone that you want to use in some Facebook ads. The only problem is, they all have time stamps on them. This article will give you some solutions for getting rid of time stamps. Simple-to-use photo editing tools can help you to get rid of time stamps on your photos. Basically, there are two techniques you can choose from. One of the easiest ways to remove a time stamp from a photo is to crop the photo. There are two basic methods for cropping photos. If you’re using a PC with Windows, MS Paint will be your go-to tool. On the other hand, if you’re a Mac user, access the Photo app, where you can easily edit your images. Windows Paint gives you one of the easiest ways to edit images on Windows. Since it comes as a built-in tool, you won’t need to load the app to your system. Cropping images on Paint is actually pretty easy to do. Crop your image in a rectangular shape. Do this by selecting the rectangular crop option from the Paint app. Click on the image and drag the cursor to select the area you want to crop. When you’re ready, hit the crop button and save your cropped image to your desired folder. Crop your image in a free-form shape. To do this, hit the black arrow below the Select button and choose a free-form shape. Crop the image by dragging the mouse on your desired path, then hit the crop button. Save your image. You can easily edit images on Mac using the Photo app. Before you can do this, you’ll have to update your Mac to the latest Mac OS X using Yosemite. It’s worth it, though, because you’ll find the Photo app simple to use. Load the image, then double click on it to start editing. Use the rectangular or square drag tool to crop the image. Hit the crop button, then save the image to your desired folder. It’s worth noting that the crop tool is a basic tool that’s available in both the Mac Photo and MS Paint apps. However, it won’t provide you with ideal results. Most of the time, for professional-looking results, you’re going to have to use advanced photo editing tools. If you need a high-quality solution to deal with your photo editing and time stamp removal jobs, try Fotophire’s feature-rich photo editing toolkit as an inexpensive alternative to Photoshop. The company offers a free trial of their app. However, images edited in the free version will have a Fotophire watermark on them. Therefore, to get the best results, you’ll need to turn to the paid version. Fotophire is easy to use, and it will remove unwanted elements from your image with just a few clicks. There are two ways you can go about removing time and date stamps from images using Fotophire. Go to the Erase tab, which you’ll find on the right side of the toolbar. Choose the tool for date stamp removal. The selection rectangle tool will give you any geometric shape you need to cover specific areas of the image. Also, you can use the Selection brush. This has a variable brush size slider to help you more precisely select the area on the photo that you wish to edit. Once you have selected the desired portion on your image, hit the Erase button and it will remove that element from your image. The Clone tab is just below the Erase tab. In order to use this tool accurately, you’ll have to choose the right source point size and brush size. The size of a source point and brush will help to determine dimensions of the area that you want to copy. These values are specific to different segments of the image, so you’ll need to make accurate adjustments for editing. To clone the specific area, hold the Alt key and select the area. Then drag your selected portion over the unwanted time or date stamp. If you need more precision, you can simply zoom or pan the area. Hopefully, this article has given you the information you need. Now you can remove those unsightly time stamps and start using some of the great photos on your phone to help promote your business. Whether small or big, technology downtime is a concern for all types of businesses. According to a new report by Ireland-based IT solutions company, ERS IT Solutions, on average IT downtime costs businesses $1.55 million every year. Businesses do not only lose money due to IT downtimes. Data shows technology downtimes impact productivity as well. On average, businesses lose 14.1 hours to annual IT downtimes. What’s more, a staggering 545 hours of staff productivity are lost annually because of IT outages. To ensure business continuity even during IT downtimes, companies spend resources. According to data, on average companies spend 200 minutes to resolve an incidence of IT downtime. On average, each week employees spend 30 minutes to fix their PC problems. Technology downtime is not uncommon for businesses these days. But companies feel its impact more severely when it coincides with a busy time of the year. During the holidays, for example, small firms lose a substantial amount of business due to technology snarls. To ensure the holiday season doesn’t affect the bottom line, businesses need to have a plan in place. The first step is to analyze historical data to anticipate downtime and take measures to reduce its impact. Regular tests of important network systems are also a great way to stay on top of things. A skilled tech team can ensure systems are always updated and secure to avoid costly downtimes. With all that’s happening in the cannabis industry, it’s a sure sign that right now is a good time to hop on board. In 2017 alone, the marijuana industry, both recreational and medicinal, reached $7.9 billion. And it’s only predicted to grow — by 2025, it’s estimated to reach $24.1 billion. State governments where marijuana use is legal are also benefiting from the high-growth industry, collecting nearly $745 million in taxes. If you’re thinking of jumping into cannabis, it’s important to know who the primary consumers are. Millennials between 21 and 35 make up 41 percent of cannabis consumers, followed by 26 percent of people between 36 and 45, 16 percent between 46 and 55 and 17 percent 55 and older. It’s nearly a 50/50 split between male and female. Most of the resumes that employers receive either as hard copies or that are uploaded electronically reside in databases. If those databases were in graphic form, each resume would resemble a lonely tombstone in a cemetery. In the majority of cases, submitting resumes is futile because they get resurrected only if they include keywords — specifically, those keywords used via computer queries made by employers, recruiters or hiring managers. Typically, keywords are phrases and nouns that have to do with technical and professional areas of expertise; projects; industry-related jargons; tasks; achievements; job titles; and so on. That contradicts what we suggested years ago by saying that it’s verbs that make a resume desirable. We now find that an effective combination of nouns, phrases and verbs is necessary because the human eye is attracted to verbs, whereas applicant tracking systems — the kinds of software used by employers and recruiters — are searching for keywords. Applicant tracking systems are searching for keywords that appear primarily near the top of the résumé. Therefore, it is advisable to include keywords in the resume’s first paragraph — immediately after the contact information. Additional keywords should appear in lists as bulleted items in the section that follows and that could be titled Skills. Appropriate keywords should be harvested from job descriptions or ads for job openings. Commonly, a job description is rich in listing a job’s requirements in terms of skills and accomplishments. For instance, if the position is technical, the ad often lists computer languages, proprietary software and the like. Pam Dixon lists such examples in her book Job Searching Online for Dummies, as follows.